Big Power Supply Co., Ltd.
We fix waterleaks in all types of Roofs. Metal Sheet or concrete roofs. We will fix gutters as well for waterleaking. If there is any type of water leaks in the building or factory we will be glad to fix the problem. It is too hot and you would like to cool down your building or factory. To save money on your air-conditioning bill. To protect and make your roof last longer. This is especially true for asbestos roofs. Big Power Supply specializes in changing old asbestos roofs and changing to new metal sheet roofs. 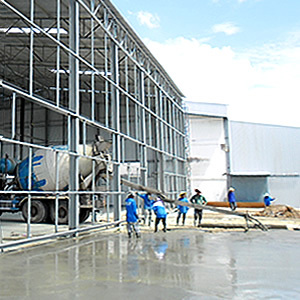 We have teams complete with engineers foremen and specialized workers who are the best in Thailand in this work. We use a lot of workers for our construction jobs to ensure top quality work. The more workers we use the faster the job will get done. This is one reason why we finish jobs faster than any other companies. 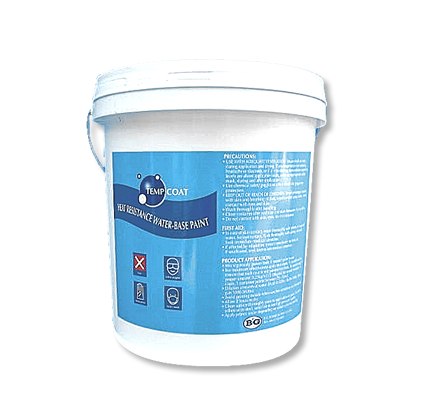 Our Tempcoat insulation paint is a high quality acrylic and silicon based water paint from Japan that is used for heat reduction and waterproofing. Our insulation paint can reduce the surface temperature up to 20 C. The silicon inside Tempcoat insulation paint is good for roof waterproofing purposes. Even though our insulation paint keeps the water out, it allows air to pass through. This prevents condensation inside the building from forming. This quality is unique to Tempcoat. We are roof specialists that deal in any sort of problem that may arise with a roof. We fix roofs by a localized repair of change out entire parts of roofs. We repair metal sheet roofs and or asbestos roofs. We mainly specialize in repairing factory or warehouse roofs. If a roof is too old we will change out the old roof and place on a new metal sheet roof. Water leaks from an old roof is a major problem our customers face and so we have a team specializing in fixing or repairing these water leaks. Another service we provide is insulating roofs. Here in Bangkok Thailand it is hot year around and our customers are often searching for a way to cool down or reducing the temperature in their factory. We provide a ceramic coating for the roof that reduces the temperature inside a factory. 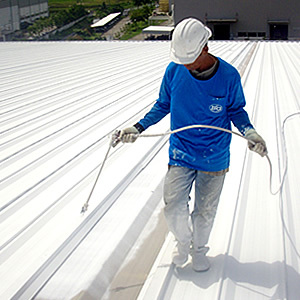 So whether it is waterproofing, insulating, or repairing, a factory roof we are confident that we can get the job done better than anyone else in Thailand. Repairing roofs has been a major business our ours. Old roofs often have rust or corrosion problems and need to be repaired. If the problem is not repaired, water may leak in from rainstorms which are quite common in Thailand. We use silicon imported from Japan patch up holes in roofs, or repair a part of a roof that is old. All factory roofs have an expiry date or end up rusting after a number of years. We can prolong the life of a roof by using specialty coatings to protect the roof from rain and weathering. By protecting a roof we can slow rusting which lengthens the life of a roof, which in the end save our customers money. Instead of changing a roof every 15-20 years we can add 10 to 15 to the life of a roof. New roof installation is also what we specialize in. 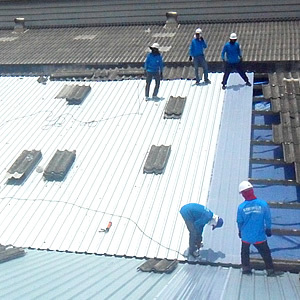 We have 3 teams of workers that just put on new factory roofs throughout Thailand. Very often a factory would like to add a new building or build a new factory and this is essentially making a new metal sheet roof and walls. Factory walls are basically metal sheet roofs installed as walls. We can build a new metal sheet roof as an extension to an existing factory or make an entirely new factory. 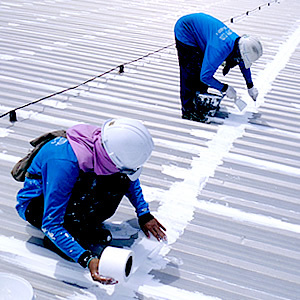 Another major roof changing business is to change out the old asbestos roof called “gabuan” in Thai, to metal sheet roofs. These asbestos or gabuan roofs develop cracks which lead to holes in the roof. If there are enough cracks or holes in the old roof we recommend changing out the roof to a new metal sheet roof. We have been working all around Bangkok and Thailand for the past 7 years changing and repairing these metal sheet roofs.